Heather Falcone was smitten by their new home when she moved to Brookline, Massachusetts, with her husband, attorney Steve Cherny, and their two young children. Designed by Boston architect S. Edwin Tobey for local real-estate magnate John Prescott Webber, the 1885 Queen Anne house was, according to contemporary accounts, built of “Roxbury stone with red granite trimmings” on the first floor, and “rough cast work” above. Featuring prominent gables, a large, open-roofed, stone porte-cochere, plinth-like stone porches, and an unusual corner entry tower, the house had enormous appeal for Falcone and her family. But she did not love the one-third-acre U-shaped lot, probably what was left after much larger grounds were subdivided and sold. “We had a mulch and shrub garden, which I just hated,” says Falcone, who owns several home furnishings, clothing, and accessory boutiques in Brooklyn, New York. 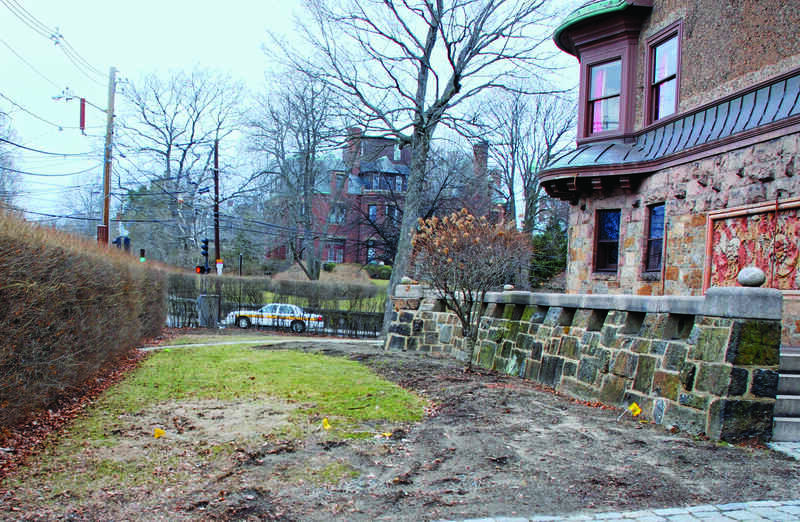 A passionate gardener, she confesses that she felt overwhelmed by the barren lot bordered on two sides by streets and oriented toward a busy intersection. 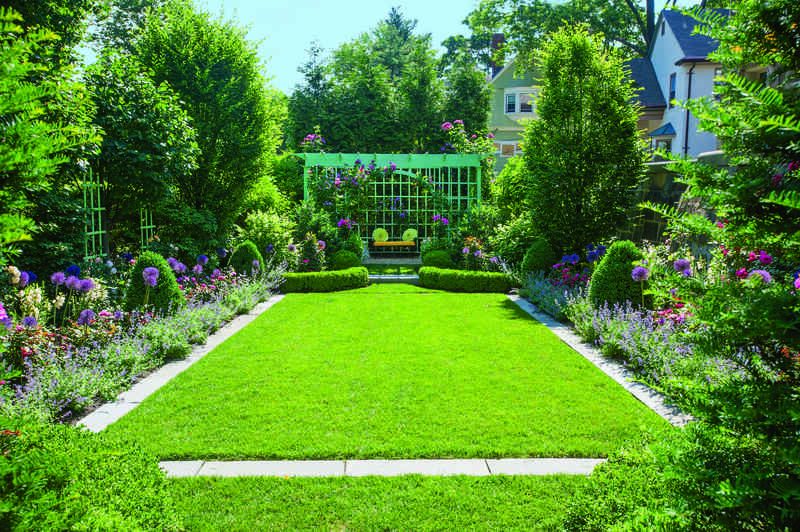 For help, the homeowner turned to A Blade of Grass, a landscape design and maintenance company located in nearby Wayland, Massachusetts. “We found a big, gorgeous stone house, but not a lot of yard space,” says Jim Douthit, landscape designer and company principal. “It didn’t feel like a garden. He created a series of outdoor rooms that provide lawns for the children’s play, a private area for Cherny, and lots of garden beds where Falcone can indulge her passion for growing roses and other flowering perennials. The gardens now provide screening from the street while leading the eye to long, satisfying vistas punctuated by sculpture and outdoor seating. Designer Jim Douthit outlined the driveway and lawns with bluestone and brownstone pavers chosen to coordinate with the stone of the house. He replaced old paving with Gravel-Lok, a modern material that resembles pea stone but is more stable—and yet permeable to rainwater. Another outdoor room, designed as a walkway transition between the driveway and entries to the house, features a bluestone-bordered lawn and a mix of flowering shrubs, roses, and perenn-ials. The makeover is stunning. Lawns are bordered with old-fashioned perennials including veronica and catmint; rosy-red Knockout roses steal the show. 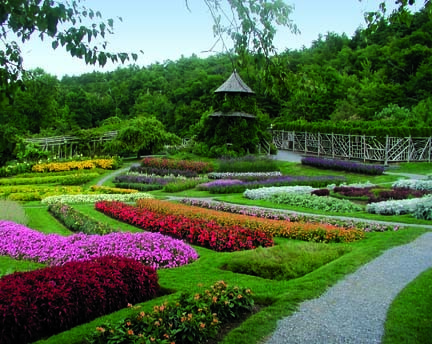 The flowers’ ever-changing display is heightened by a backdrop of the house’s granite on one side, dark foliage trees on the other. Traditional granite pavers demarcate areas in the Gravel-Lok surfaces. 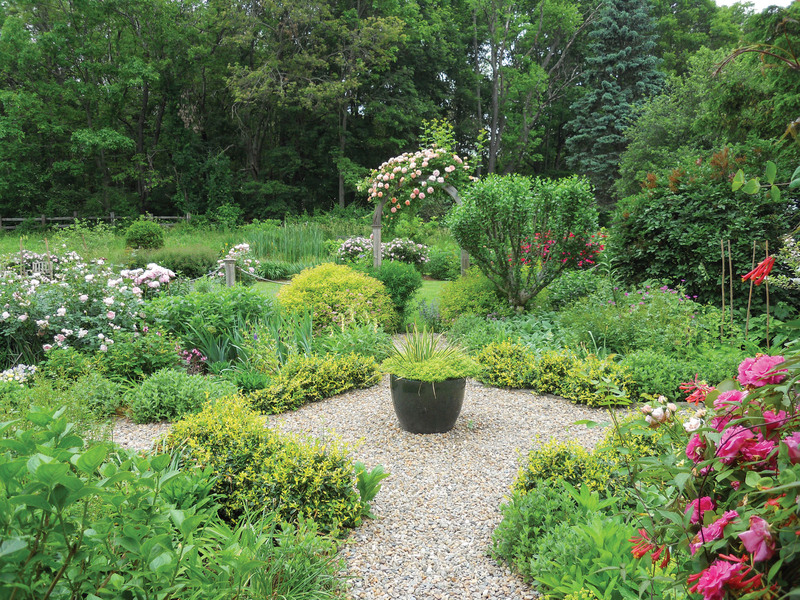 Jim Douthit designed a new approach that features two sod and stone checkerboard areas flanking a central, boxwood-planted round garden feature. A stone and sod checkerboard can act as a walkway, a transition between lawn and paved areas, or simply a bit of whimsy in an unremarkable expanse of grass. In Heather Falcone’s Brookline garden, two pyramid-shaped checkerboard compositions flank a central round feature approaching the front steps. Both the checkerboard and the circle are laid in bluestone pavers. To install a stone and sod checkerboard, the most important step is measuring before starting, says designer Heather Lashbrook Jones. Pip, Heather Falcone’s English bulldog, rests next to planters. Bourbon roses are a favorite of the owner. At the corner entry, wide granite steps descend to the front yard, where now a checkerboard enlivens a lawn; pavers are bluestone to coordinate with the house. Near the side door is a bluestone-bordered seating area, situated for privacy and shade. She’s referring to the ubiquitous ground cover composed of dyed wood chips, spread over soil to dress beds, hold moisture, and keep down weeds. Wood mulch never made it into this garden. “In the first place, all the different kinds of commercial mulches stink,” points out the gardener who grows roses for their fragrance. 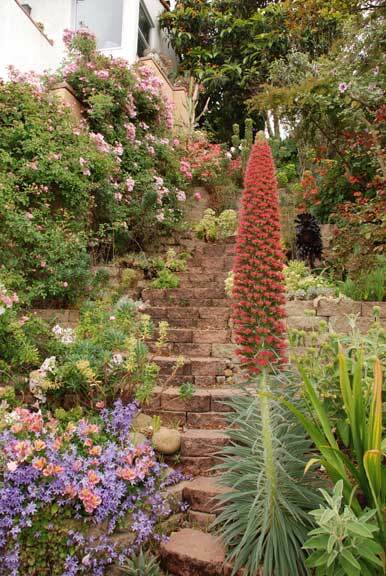 garden combines dense planting with paved areas. Behind the porte-cochere, a parterre of beds convenient to the kitchen door grow flowers, herbs, and vegetables. The willow edges are known as hurdles. The homeowners built a small greenhouse at the back of the house, its glazing composed of discarded windows.